How To Be Your Dog’s Leader – Being the leader of your dog does not always seem an easy task, and many owners do not know how to do this, nor do they care to show the dog that the tutor is their leader and to make the dog behave more acceptably. 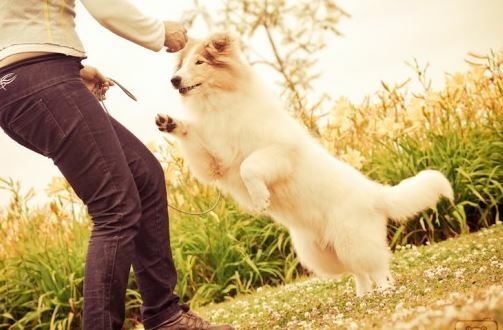 In this article we will explain how to deal with your dog in the most “simple” way possible, being able to educate your dog is much more than teaching some tricks. It requires a lot of persistence on your part and a full-time leader behavior. Stop acting like your dog was a person, no matter how loving he is to you, and as much as you love him and see him as a son, the dog is not people, he understands that the family is a pack and he is part of this pack. You need to be the leader of the pack, the leader of the dog. Stop attitudes that discourage the dog from acting like a dog, this causes confusion in the dog as well as being unhealthy for mental balance can also harm the dog’s physical health. What attitudes would these be? Unnecessary clothes, accessories that cause discomfort, shoes without need, many products of beauty for the hairs, there are owners who put their dogs even in strollers. Put the dog in his lap all the time, do not let him play with other dogs. It may seem negative, but it is not, the dog needs to understand what the family hierarchy is. The tutor comes up, who comes next? Even children should be in this hierarchy, and they should be above the dog. The dog should be the last in the hierarchy, so he will respect the commands of everyone in the house. One of the big mistakes that make dogs stop being obedient is the great exaltation of the dog, treating him as the owner of the house will make him act as the leader and therefore not obey. That’s right, obeying your dog is one of the biggest mistakes that can be made. The dog demands that you leave the sofa and you leave? It was his leadership. Do not obey your dog under any circumstances, that does not mean treating him badly, it means that you will not meet his demands. Two of the great demands that dogs make is to cry and bark for attention and ask for food while the owner eats, does not give food while he asks, or gives attention while he cries, it will only reinforce those behaviors and reduce his leadership. Ignoring the dog is one of the best ways to demonstrate that you are above it in the family hierarchy. Your dog will understand that his attitude is being disapproved. Always walk in front of your dog, do not let him walk in front of you during the rides, and do not let him walk in front of you. Yes, first passing through the doors is a signal of leadership for the dogs, so always walk past your dog and get the dog back and then get past you in case he gets ahead. Yelling and hitting your dog does not make him want to obey you, makes him understand that violent behaviors are natural attitudes, and creates a misbehavior in the dog. Dogs challenge their tutors’ leadership every day, believe me, it will always do something to challenge you. If you educate your dog properly, he will do things like pass in front of you at the doors, disobey one or the other order. Dogs raised with violence will attack their owners for believing that this is the natural way to gain leadership. Cuddling, partying and caring 24 hours a day will destroy your authority, praise you at the right time, just as you complain at the right time, you have to learn to do everything at the right time. Praising the dog when he is quiet, when he obeys, this is one of the attitudes that most strengthen his leadership. Why do dogs need leaders? Have you ever imagined how stressful it must be to lead a pack? The dog would need to protect each member, give orders, defend the territory, the house, prevent other dogs or people from doing harm to their pack. The dog needs a leader to stay calm, if he feels that his owner is unable to lead the family, then the dog feels obliged to take the lead of this family and take care of everything. That’s why every dog ​​needs his tutor to be his leader, but besides being the dog’s tutor, create a routine for him, make him spend his energy and play with his instincts, hunting toys, running after balls, doing daily walks. This will help the dog relax and care less about the pack leader.